First and only FDA approved nonsurgical treatment that contours and improves the appearance of fat under the chin (double chin). Hardness in the treatment area. 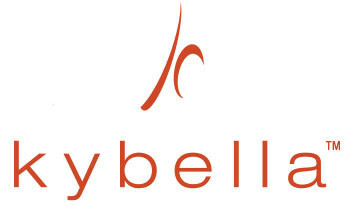 Active ingredient in KYBELLA is deoxycholic acid, a naturally occurring molecule in the body that aids in the breakdown and absorption of dietary fat. When injected into the fat beneath your chin, it causes the destruction of fat cells. Once destroyed, those cells cannot store or accumulate fat. Typically 15-20 minute procedure in the office. The appointment slot could be longer for possible numbing procedures. First agrid is made with boundaries drawn to avoid damage to vital structures. Second dose planning is made with respect to the size/amount of fullness which needs to be addressed. Typically 14-50 shots given with a needle which is the same as a very small Botox needle. The dosing and number of shots is customized for each patient. Most patients report a 4/10 pain scale experience with the first few minutes after injection of Kybella. Then the pain level subsides rapidly. Methods such as ice, pain reliever pills, numbing cream, numbing shots, ring blocks, tumescent lidocaine injections are possible methods to help keep the pain under control. It seems with subsequent sessions the pain level seems to decrease. Many patients treated with KYBELLA experience visible contouring of their chin profile in 2-4 treatments. Some require 6 treatments. Once your chin profile has improved, you may not need to be treated with KYBELLA again. Is there skin tightening with Kybella? For most patients, downtime was minimal and occurred most commonly after the first treatment session, usually 1-7 days. Patients can wear a compressive neck band as much as they can for 1 week after the procedure. The bruising, pain, numbness, redness, and areas of hardness in the treatment area might get in the way of some social plans and work commitments in the following week – especially the first two days after the procedure.